Somehow, I am hurtling towards being 23 weeks pregnant. Somehow, we’re in our third week of the #BlogBumpClub (the new blogger antenatal club!). And somehow, it’s Thursday of half term already. I swear time is speeding up for me at the moment. That’s sort of how it’s been throughout this pregnancy actually. Although I felt really sick and tired in the first trimester, it did hurtle along pretty quickly. And now I’m already over halfway there it seems kind of unreal. I remember being pregnant with Frog four years ago and forgetting what it felt like NOT to be pregnant. Time seemed to move more slowly back then! The last week has reminded me of the need to listen to my body a bit more at the moment. It’s half term, so the daughter and (teacher) husband are both at home. That means cramming in more family activities alongside my regular work deadlines – and some redecorating. Last night I was sick again for the first time since I was 12 weeks pregnant. A reminder that I’m not super-woman and tiredness is especially unglamorous when you’re pregnant. Still, it was nice to have a night away in my home town of Bristol last weekend. I caught up with my oldest friend and we had lunch, went to the cinema, did a spot of shopping and she even did my nails. It was AMAZING. If you’re struggling to find maternity clothes then I suggest you check out Jennie at Edspire’s #BlogBumpClub post from last week – Pregnancy Pretties. There are some lovely brands featured, including some lovely comfy PJs which are my main obsession at the moment. So how have you been this week? 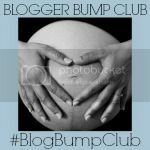 Link up and don’t forget to join in the chat over on Twitter if you like too – just follow our hashtag #BlogBumpClub. It’s always nice to find others in the same boat! There’s also a badge too – you can grab it yourself at the bottom of this post. Thank you! They are my fashionista trews – the NLM finds them amusing. Because he is not a fashionista. Obvs. It was SO good! Know what you mean about it flying by – I’m sure it goes quicker second time around! Oh no! So sorry you were sick last night. Off to Topshop now to steal your trousers!! I think time just does hurtle on faster with subsequent pregnancies, partly at least because if you have older children your entire focus isn’t directed at the bump, but spread around a bit more, and party because time does just seem to move faster the older I get! Or at least, that’s completely true until the last two weeks and then it slows to a crawl again!! And I’m with you on having to remember that I’m not superhuman – I’ve had a bit of morning sickness again this week and I know it’s a strong hint to slow down!